I get hard on myself in the summertime. Every spring I have a list a mile long of things I want to do outdoors. I've got a pile of junk 2 stories high just waiting to be "done up:. or started for that matter. I haven't even finished my back porch stuff. But in the spirit of lightening up a little bit, I have decided to focus on what I HAVE gotten done this summer. I pulled out some of the junk that fills up my parking spot in the garage and planted my $.99 half-dead cast off flowers. And I tried to do something about my driveway. I try never to show pictures of my driveway. Like a big football field of concrete. It almost looks better since we are parking in the driveway. It covers up part of the vast wasteland of concrete. Anyway. 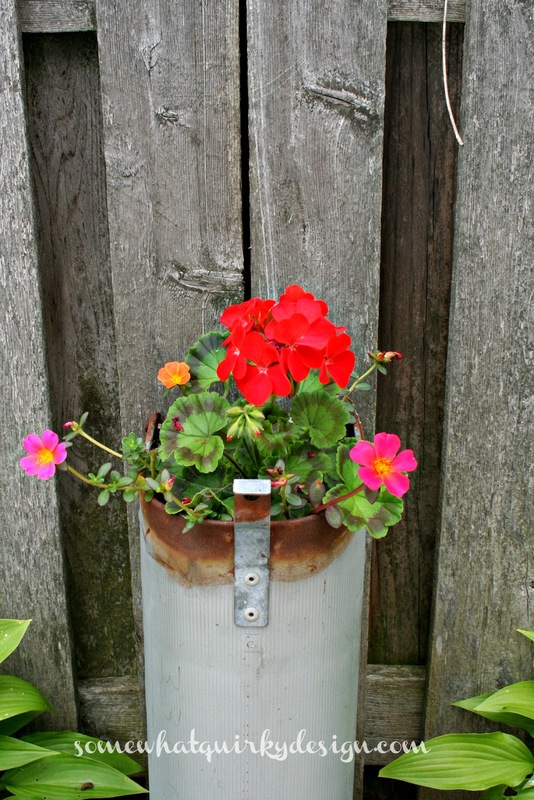 I combined these planters with some other junk and placed it randomly along the driveway. I think it helps a bit. 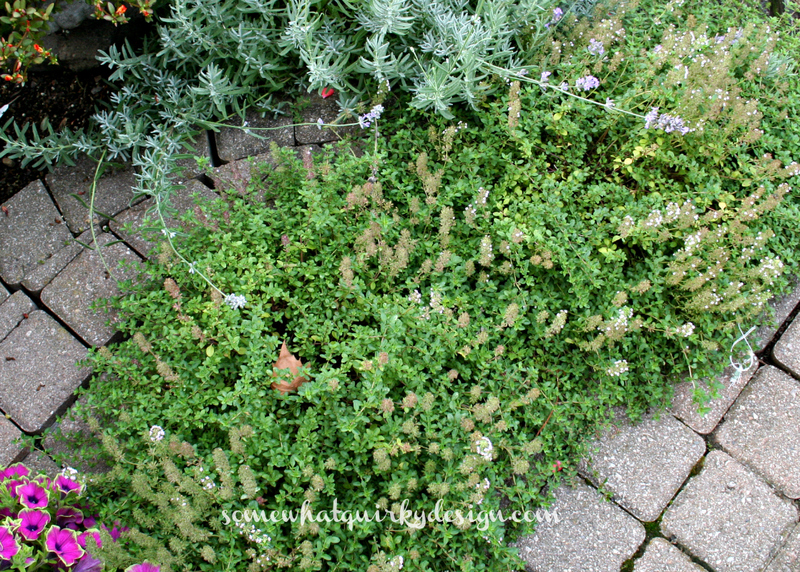 The thyme that has invaded my stoop is abundant. There is still a little path walk through. The succulents have FINALLY taken off. Just in time for fall when they have to go back indoors and get leggy again searching for sun. Whoever said that succulents are easy . . .
don't get me started . . . it wouldn't be pretty. I've made 25 or 30 recipes of pesto. 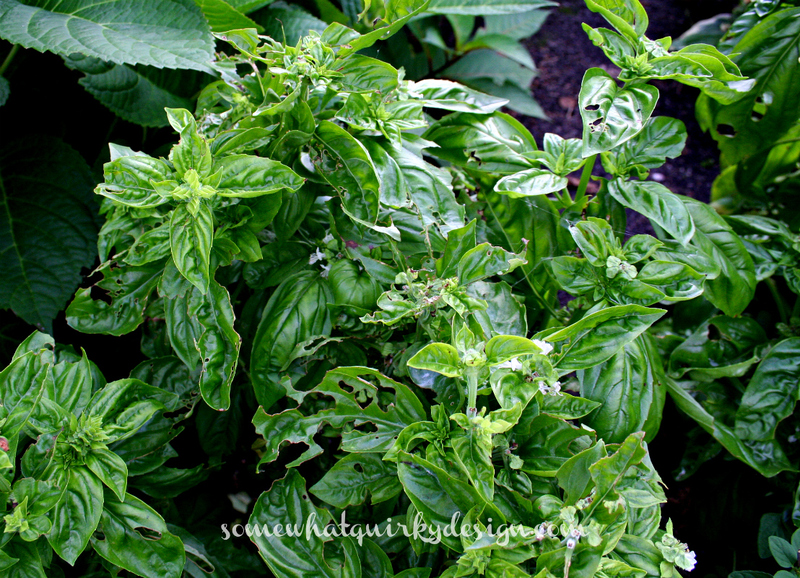 But it's been a bad summer for basil. And then there are the grasshoppers. Which I am pretty sure are what is eating the basil. Chomp. Chomp. I only find a few hiding out in the hosta when I water. But I guess it only takes a few. I finally got ONE, yes ONE, bloom on my Blushing Bride hydrangea. It is blushing perfectly though. 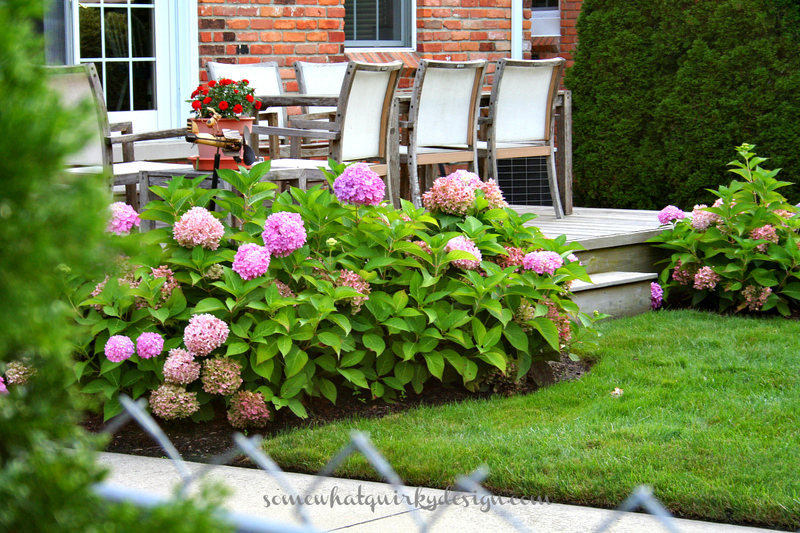 I think I'm going to put up a burlap fence around the hydrangeas this winter to see if I can protect the new wood that grew out this year and will get blooms next year. I also finally got a bloom on my Endless Summer hydrangea. Endless Summer and Blushing Bride are supposed to bloom whether or not they had to be pruned back in the spring. But they did not. At least MINE did not. He does nothing. Never takes them indoors. Never dries them. He only planted them because I told him to. And look what he gets. I'm not sure he deserves them. On other hydrangea fronts . . . The Forever and Ever blooms appear to be drying on the bush. A sure sign that fall is near. 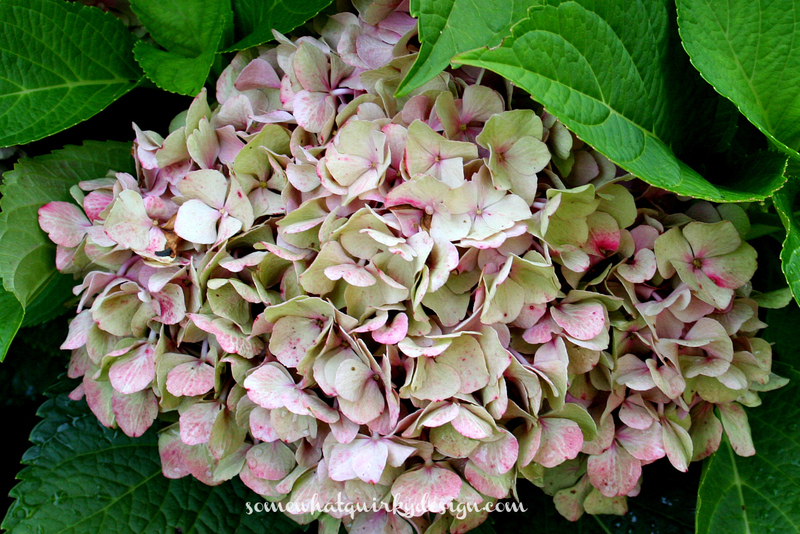 I find that pink hydrangeas don't dry well when picked early while they are bright pink. I leave as many as possible on the bush as long as possible. Then I bring them in to dry in early fall. This gives me the results I am looking for. The Quickfire is doing quite well. It always does. I believe Quickfire is in the same class as Limelight - which is having a banner year. I don't have a Limelight. Yet. 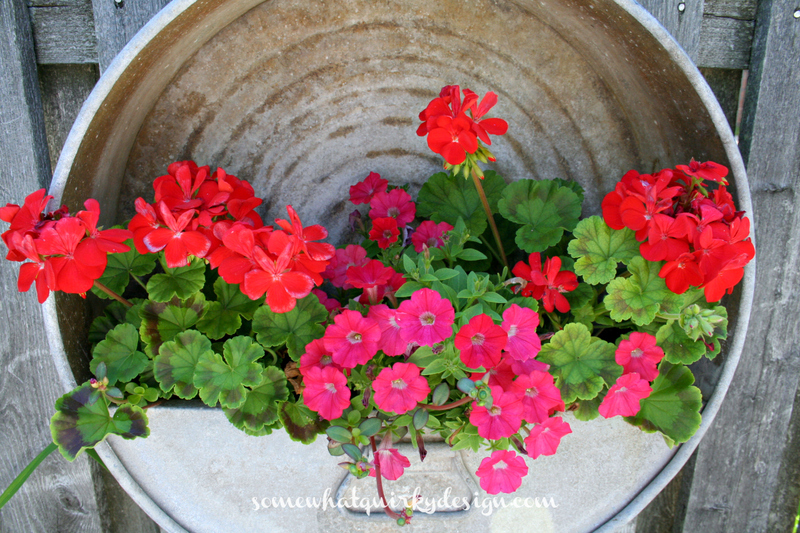 I love these planters that I found at an estate sale. 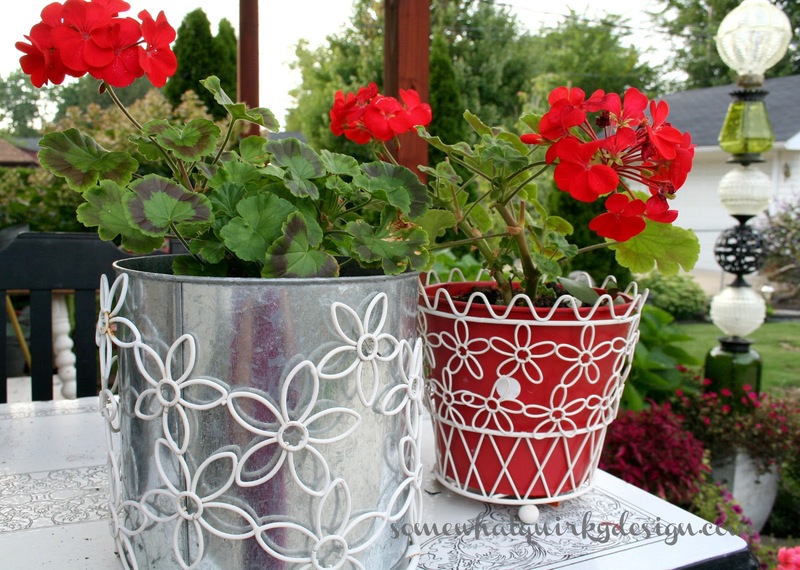 I wish I had photographed these when the blooms were heavier on the geraniums. I also wish I had taken the price sticker off the red one! I had a bumper crop of Purple Hyacinth Bean. 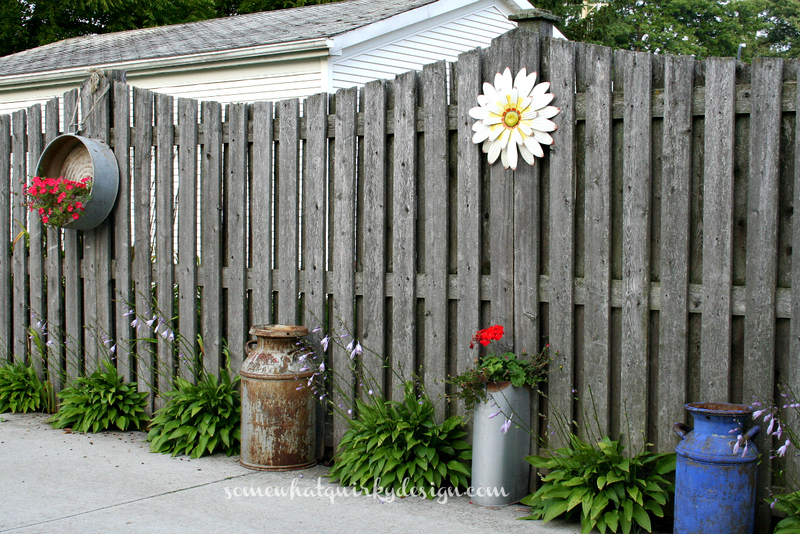 These are really great if you have a span of fence or trellis that you would like covered for the summer. They are an annual, but I had several volunteers come up this year, so they may be more prolific in hotter, sunnier climates. These vines will produce enough seed pods for the whole state of Michigan. So if you are interested in growing some next year, let me know and I will gladly share the seeds with you. And I leave you with another one of life's great questions . . . This is my Ninebark bush. Last year I got one of these leaves. This year I got two. Do you think in 936 years that the whole bush will be bi-colored? Well it sure looks nice to me!! Hopefully we will have a nice Fall and you can do Fall gardening!! 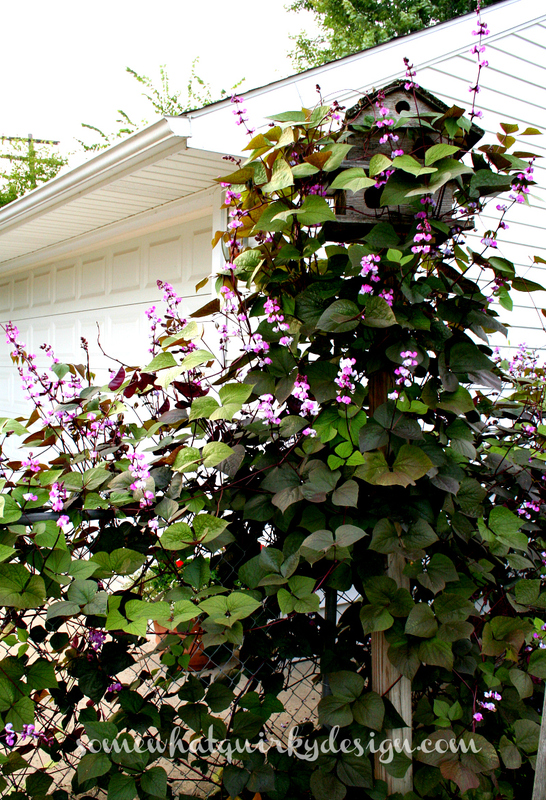 And, I need some of those purple hyacinth bean seeds! I had a bunch of seeds and cannot find them! So send me some of those! Everything thing here looks like the desert = high heat and no humidity - my plants have folded their leaves in disappointment. Yours are lovely as usual my favorite is the Quick Fire - probably because I cannot get it here - the nursery said i would be very unhappy with its performance. i have never seen a leave like that where the color is seperated so distinctly. your garden plants are so pretty . We are kinda at the point where things are a bit stale/slat with color so I will be looking forward to the fall. 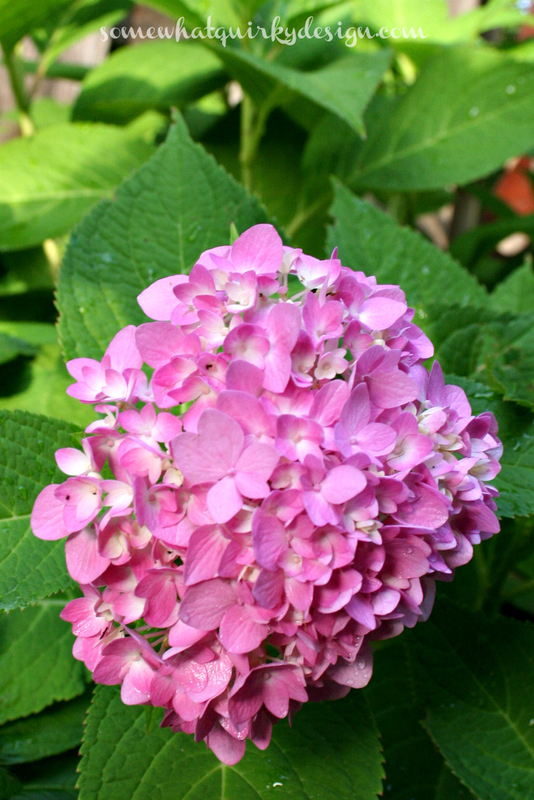 That reminds me I promised you a photo of my sad hydrangea. Maybe tomorrow. Love the way you decorating your football field. We have a short little driveway- big enough for 1 car length. We are in such a drought that I don't even want to talk about my garden. In 936 years I will have MY to-do list completed. Right? What you HAVE accomplished is absolutely beautiful. 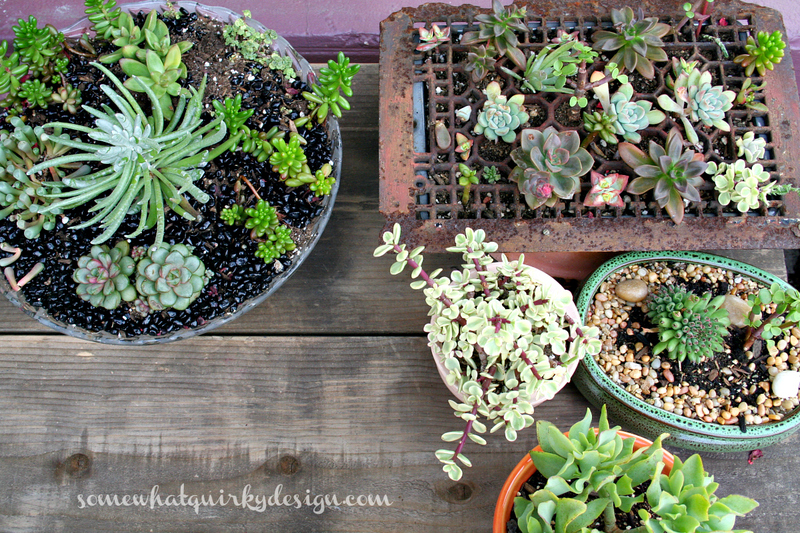 And I am totally going to copy your succulents growing through the grate. Laughing all the way through this post. Beautiful pictures. Thanks! 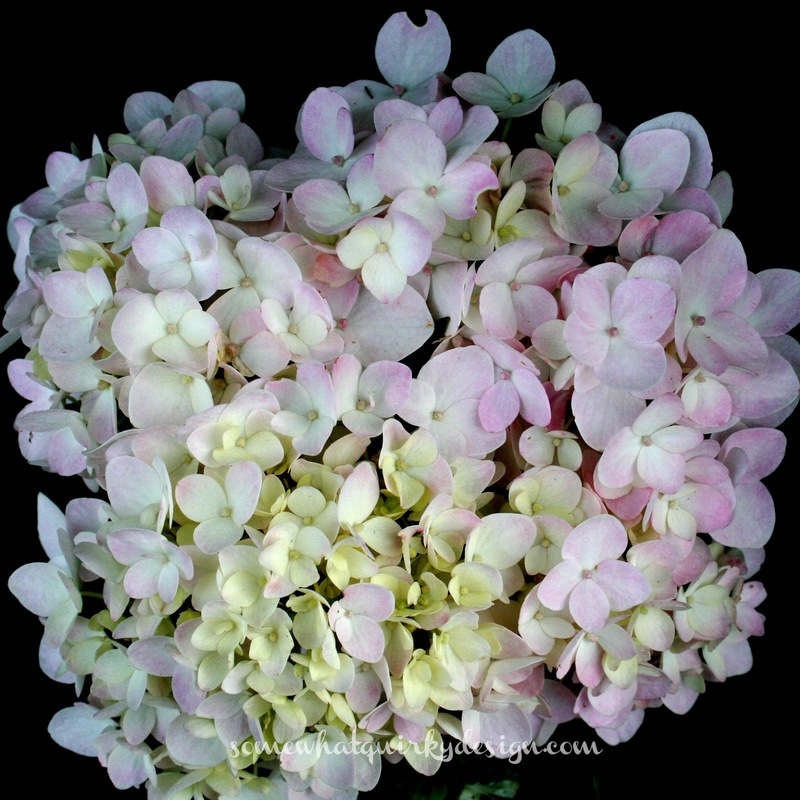 Love your spectacular collection of hydrangeas. 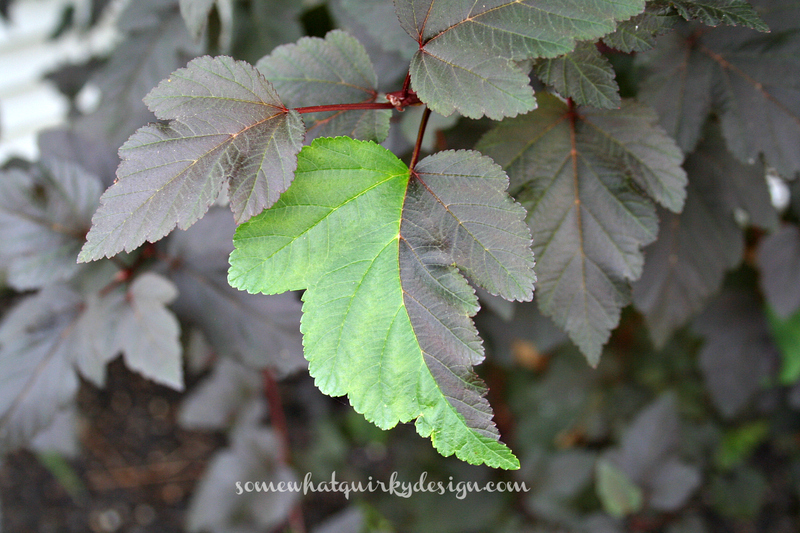 I have Limelight + is doesn't do very well for me - just limps along year after year... Send me some of your hyacinth beans!!! Karen, I love this post! I'm beginning to think about all of the stuff I can plant late fall and early spring and I had forgotten that I love nine bark. You're flowers looks gorgeous! Stumbled upon your plate valance photo on Pinterest, then perused your blog. Gorgeous! 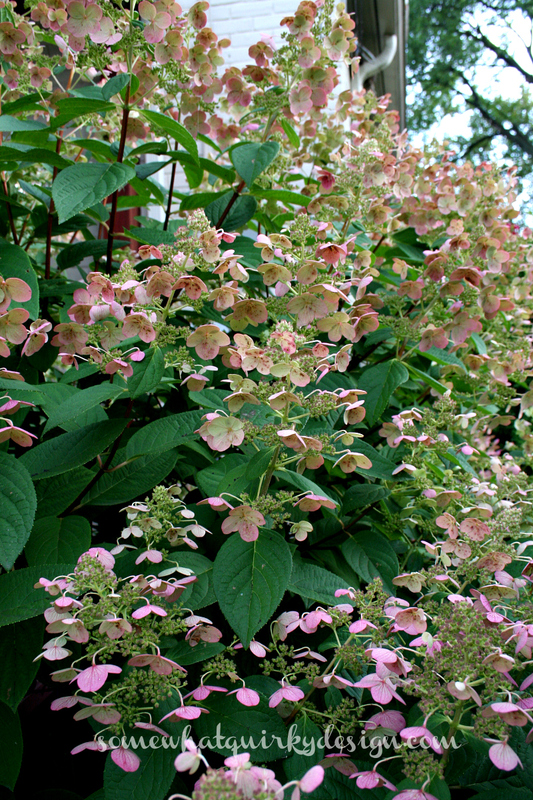 Check out my blog posts on pruning Hydrangea paniculata. Love the lemon bread recipe. I can't wait to try it; I plan on throwing a little dried lavender into the mix. OK, I'm going to go dig through our stuff and get ready for planting next year. I kill almost everything, but I love what you did and want to try again.